Prince George’s County is re-writing its entire zoning code, something that is long overdue and destined to bring a host of very good new policies to the county. However, in the latest public draft of the zoning code, an old and really terrible idea has resurfaced, one that Maryland’s highest court outlawed just a few years ago. Its nickname is “call-up,” and residents should be wary of attempts to bring this process back. If you want to build something in Prince George’s County, you must inevitably submit something to the Prince George’s County Planning Board, a state agency in charge of planning and zoning housed under Maryland-National Capital Park and Planning Commission (MNCPPC). Prince George’s County has a particularly restrictive zoning ordinance (one reason it’s a good idea to amend it!) so there are not many projects that you can build “by-right” in the county. “By-right” projects fit perfectly into the existing zoning for the site, so overly restrictive zoning means that more often than not one has to to go before the Planning Board for some sort of special exception or site plan approval. 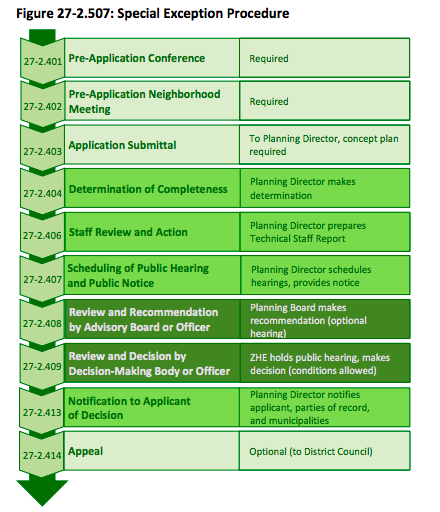 Depending on the request, the Planning Board directs a public process, then makes its decision. Prior to 2015, development projects might also have had to face another decision making body: the Prince George’s County Council, the top governing body of the county. For many years county councilmembers could “call-up” a particular project or plan at will for an additional hearing in front of the full county council. They could elect to do this even if the development decisions were uncontested by both the developer and opposing parties. Worse still, county councilmembers could completely reverse the Planning Board’s decision based on their own views about the project. A councilmember might go this route at the request of a certain party or group, or because he or she simply had a personal concern about the project. MD Court of Appeals 2015. Image by Maryland Judiciary. This was a situation ripe for corruption. Let’s say a councilmember had a grudge against a developer, or worse, was soliciting donations from a developer. That councilmember could then threaten (or actually exercise) “call-up” on one or many of that developer’s projects, even the uncontested decisions. This of course would add months of delays and costs for the project, or it could result in a scrapping of the project altogether. In a county with a reputation for pay-to-play politics, “call-up” was a particularly problematic tool. This was a big deal. Essentially the court’s decision clarified that the County Council’s proper role in the development review process was as an appellate body rather than another decisionmaker. Therefore, the council was required to judge development cases as an appellate court would, looking at whether something was done wrong in the proceedings of the Planning Board. It was not free to simply re-try and disregard the Planning Board’s determination at will. The ruling significantly redefined “call-up”, which was all too often used to relitigate an issue. Other area jurisdictions don’t have this cumbersome “call-up” procedure. Montgomery County, the other county underneath the jurisdiction of the MNCPPC, does not use their elected county council as a de facto appellate court, but rather passes such cases through the court system. Some on the Prince George’s County Council didn’t like this change, and lobbied the Maryland General Assembly to get their “call-up” privileges back in 2016. Fortunately, that effort failed when the bill died in committee. One of the main goals of Prince George’s County’s zoning rewrite was to clean up and update the more than 50-year-old zoning code. There are many good reforms you can find in the most current draft: Disappearing parking minimums, nice! Smarter development near transit, right on! It seems last year’s version of the zoning rewrite also deleted remaining vestiges of the “call-up” process, but the most recent draft released in September seems to have reinstated it. Page 93 of 2016 draft. Image by Prince George’s County Planning Board. This confirms that the County Council is the first-level appellate body if any of the parties to the case want a to appeal a Planning Board decision (basically, in line with the Maryland Court of Appeals’ decision). Page 182 of 2017 draft. Image by Prince George’s County Planning Board. 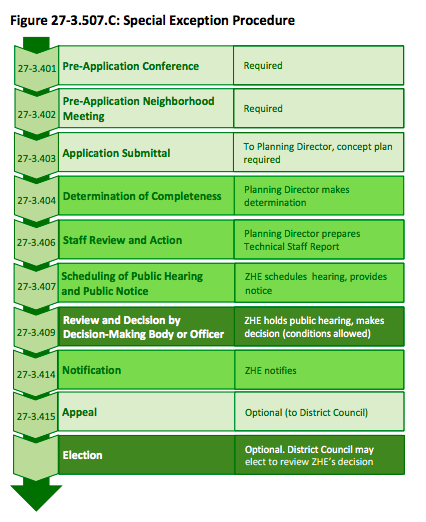 With the reinsertion of this “election” step, the County Council would retain the same “call-up” authority to require an additional review on development decisions like special exemptions, variances and site plans, even if no one else appeals and opposes the development decision. Even though the council would not necessarily be allowed to re-litigate the case willy-nilly, as they did prior to the 2015 court case, the “call-up” process would still result in significant delays and confusion in the development approval and review process. What is more, under the new standard set out by the Maryland courts, this kind of call-up review serves very little useful purpose (if it ever did before.) The council cannot do anything more to change the Planning Board’s decision than a court could — and all parties still retain the right to go to court even after the conclusion of the call-up review process. All this “call-up” process does is make it more difficult to build things in Prince George’s County, which puts the county at a competitive disadvantage with its neighbors. Keeping an arcane, unnecessary, and cumbersome development review process in the new zoning ordinance would be completely contrary to the goals of the zoning rewrite. Please use the buttong below to submit a comment to the Planning Board and let them and the County Council know that the “call-up” process should be removed from the updated zoning code. Prince George’s County has already gone through this. “Call-up” was a bad idea then, and it’s a bad idea now.